“The last person to leave Canada left the door open.” That is one person’s assessment as to why the weather in Yuma is much colder, and wetter than it should be. 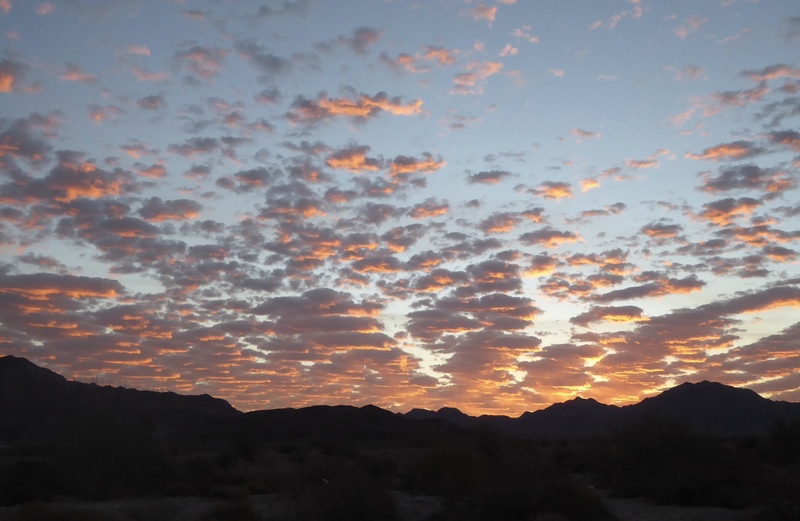 Yuma is supposed to be the sunniest city in America with 330 days of sunshine a year. So far we’ve had way more clouds and rain than is typical. We laugh because 10 days ago (while still in Boise) we would have thought low 60s with rain and/or overcast skies would be just fine. How quickly our perspective changes – and we know that none of you are going to feel sorry for us at all! Nor should you. We are pretty sure the Canadians aren’t really to blame and it would be hard to find the one who was responsible anyway because there are lots of Canadians here. We heard one estimate that 65% of park residents are Canadian. We have met people from British Columbia, Alberta, Ontario, Saskatchewan and Nova Scotia. In fact, in our visit to the hot tub last evening, we were the only Americans there amongst a dozen Canadians. We had a fun conversation with a couple from Saskatoon, Saskatchewan. Apparently the combination of Simplot potatoes from Idaho and canola oil, supplied exclusively out of Saskatchewan, is the secret for McDonald’s excellent French Fries. Our truck and trailer have been so dirty for the last few months and we were glad to have the opportunity to have them washed and waxed between raindrops. The park does not allow washing vehicles ourselves but does allow professionals to come in. At a cost of $135 for both – we were delighted to let someone else do the work! It is so nice to live in a clean trailer again. There are many activities here in the park and we have been partaking in a variety of them. 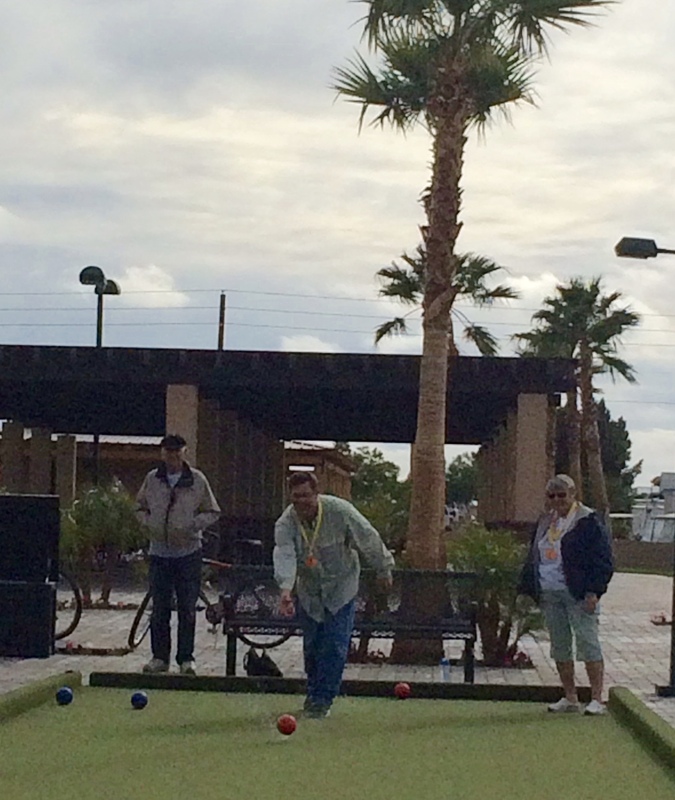 The only time this week that the Sports Complex schedule and the weather matched up nicely for us was the afternoon they were teaching Bocci ball. We really enjoyed learning the basics of the game and liked that the rules are quite simple. There is lots to learn regarding technique and strategy, but the rules are simple! 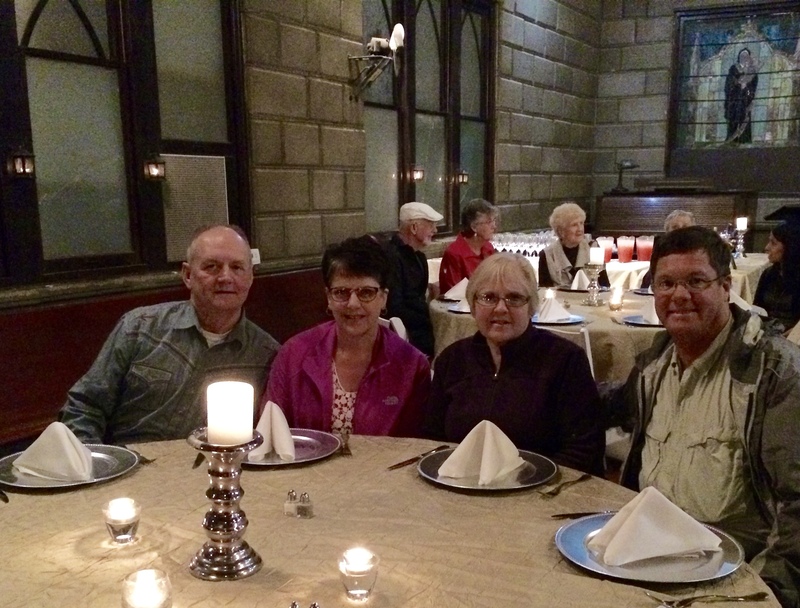 One rainy evening we enjoyed a Savor Yuma Food Tour with our next door neighbors from Wisconsin, Myron and Peggy. 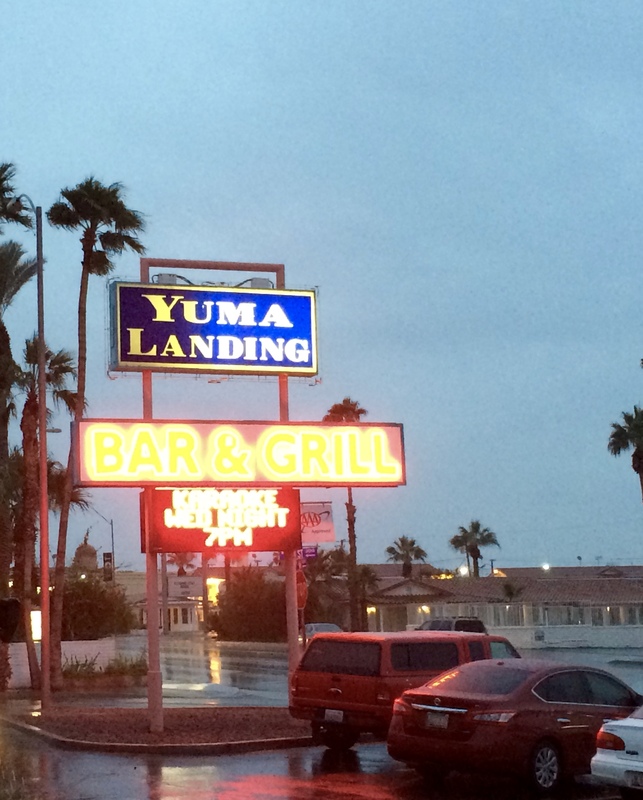 We began with appetizers at a restaurant called Yuma Landing. It is so named because the first plane ever to land in the state of Arizona came to Yuma on October 25, 1911. Piloted by Robert G.Fowler, the Wright Model B biplane, weighing 800 pounds and capable of reaching a top speed of 45 MPH, stopped here for a few days on its successful route from Santa Monica, California to Miami, Florida. We then had a salad course at a local hotel restaurant – the salad was good but the destination was unremarkable. However, the destination for our main course, Old St Paul’s Church, was quite remarkable. The church was built in 1909 in the style of an English chapel and is listed on the National Register of Historic Places. 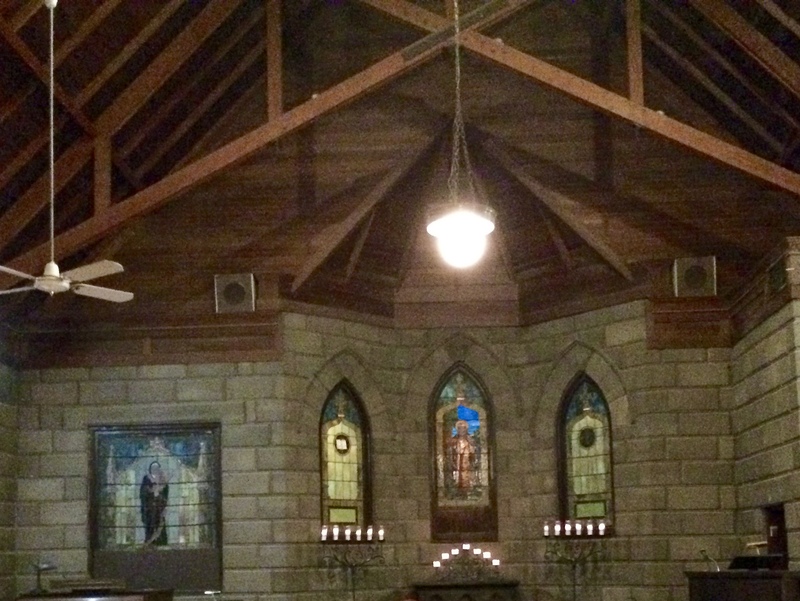 The stained glass was imported from an even older church in Europe but the details are lost. Old St. Paul’s is considered to be the finest Gothic building in the southwest and is now a cultural events center. It was raining quite hard the night we were there and there were buckets inside the church collecting rainwater. I’m glad to say they were able to find an area where we could eat without getting wet and are happy they are already scheduled to get a new roof next month. Continuing the water theme, the tap water in Yuma is really not drinkable. 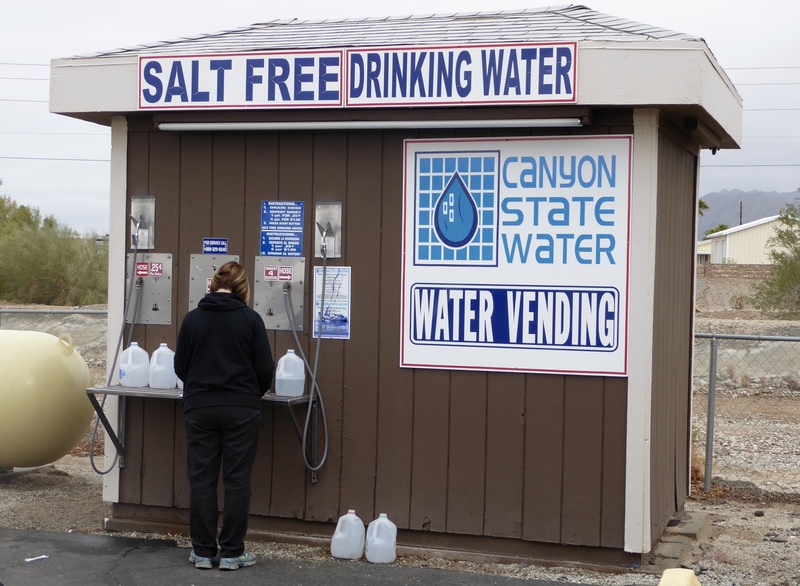 It tastes very salty so buying drinking water is the norm. We have a dispenser very close to where we are parked and a gallon costs 25 cents. Elko and I walk over and buy water nearly everyday. I took this picture of Randy and Elko on our first day here and it hasn’t been that warm and dry since. However, the skies seem to be clearing up so we are encouraged that the weather, and the choice of outdoor activities, will be better soon! The sunrise out of our back window. Hi Serene and Randy and Elko. Thanks for all of the interesting updates! How long have you been “on the road” now? It would be fun to read some time about lessons learned or things you would have done differently. For example, was the 5th wheel a good choice or would a Class A have been better? What about your layout in the 5th wheel? Traveling with a dog? 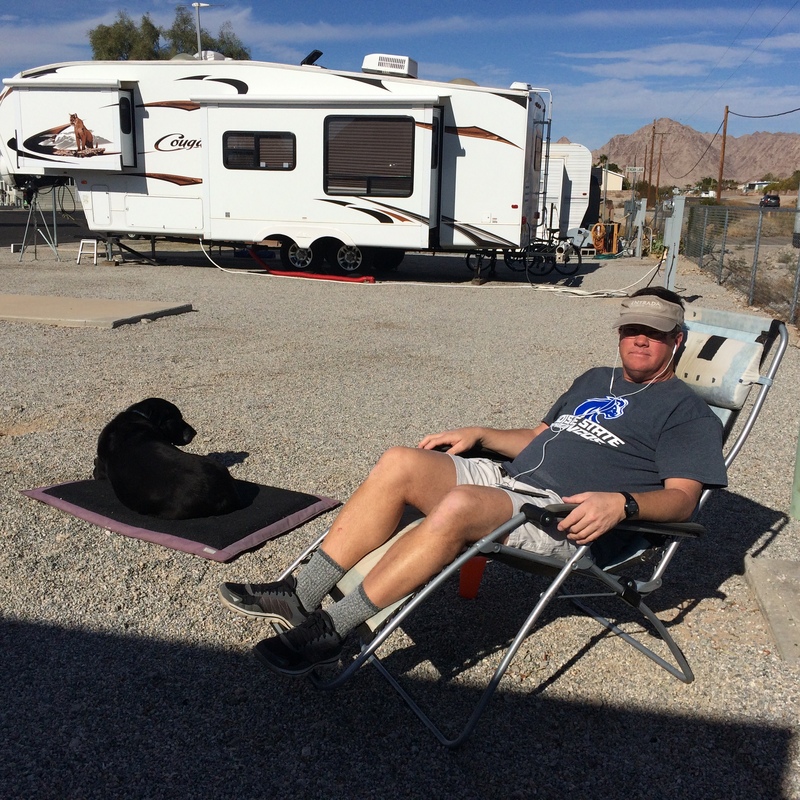 Chip and I often discuss purchasing an RV after he retires. We can do that Shari. We’ve been out here a year and a half now so we have some perspectives on how what we decided has worked for us. The food tour looks like an interesting idea. Too bad the weather hasn’t been great, but I’ll bet it is a whole lot better than what you left behind in Idaho!! We have done food tours in a number of places – always enjoy them. Weather here is very nice today, Elko is hot since he isn’t use to it. For sure better than Boise! It was great to hear your update. Rain and 60 sounds wonderful! Hope you are both doing well! We just think it is silly that we are still complaining about the weather!